Apricot, Prunus armeniaca L., is a member of the Rosaceae family, along with apple, pear, peach, and other stone fruits. The apricot is found in the Prunophora subgenus within Prunus along with plums. Hybrids between plums and apricots have been produced recently which are said to be finer fruits than either parent. A “Plumcot” is 50% plum, 50% apricot; an “Aprium” is 75% apricot, 25% plum; and the most popular hybrid, the “Pluot” is 75% plum, 25% apricot. ‘Blenheim’ (syn. ‘Royal’) is by far the major US cultivar, accounting for over 80% of production. Others include Tilton, Wenatchee Moorpark, Perfection, Earlicot and Autumn Royal. The center of diversity of the apricot is northeastern China near the Russian border (in the Great Wall area). From there it spread west throughout central Asia. Cultivation in China dates back 3000 years. The Romans introduced apricots to Europe in 70-60 BC through Greece and Italy. Apricots probably moved to the US through English settlers on the East Coast, and Spanish Missionaries in California. For much of their history of cultivation, apricots were grown from seedlings, and few improved cultivars existed until the nineteenth century. Cultivars vary among countries, and in Turkey, Iran, Iraq, Afghanistan, Pakistan, and Syria, a great deal of the production is from seedling orchards. Cultivation in the USA was confined to frost-free sites along the Pacific slope of California, due to early bloom but relatively high chilling requirement, and fungal disease problems in humid climates. Now, most of the production in California is in the San Joaquin valley. Statistical production information in this day and age is available online from a variety of sources. However, depending on your source, the data you get may be dated, incomplete, misleading or completely inaccurate. You need a source with reliable data that is updated often and accuracy checked by the scientific community. Therefore, please allow me to refer you to two different sources for your United States and World production numbers. 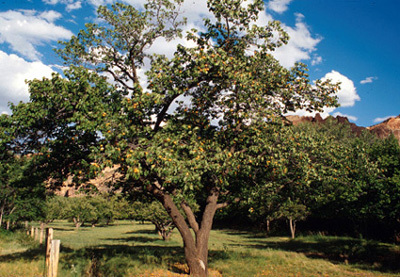 Apricots are small to medium sized trees with spreading canopies. They are generally kept under 12′ in cultivation, but capable of reaching 45 ft in their native range. 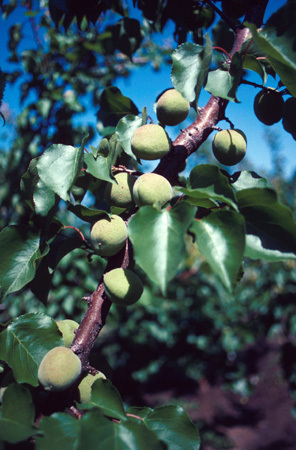 The one-year-old wood and spurs are thin, twiggy, and shorter lived than those of other stone fruits. Leaves are elliptic to cordate, with acute to acuminate tips, about 3″ wide; wider than leaves of other stone fruits. Leaves have serrate margins and long, red-purple petioles. Flowers are similar in morphology to peach, plum, and cherry. White flowers are borne solitary in leaf axils of 1-yr wood, or in leaf axils on short spurs and appear to be in clusters. There are 5 sepals and petals, many erect stamens, all of which emanate from the hypanthium or floral cup. Ovary position is perigynous. Major cultivars of the USA are self-fruitful and do not require a pollinizer; exceptions include ‘Riland’ and ‘Perfection’ which are self-incompatible. Honey bees are the major pollinator. A drupe, about 1.5″-2.5″ wide, with a prominent suture, yellow to orange ± red blush, having light pubescent or a nearly glabrous surface. The pit is generally smooth, enclosing a single seed. Flesh color is mostly orange, but a few white-fleshed cultivars exist. Trees are fairly precocious, and begin fruiting in their second year, but substantial bearing does not begin until 3-5 years. Fruit is borne mostly on short spurs on mature, less vigorous trees, but can also occur on long lateral shoots of vigorous trees. 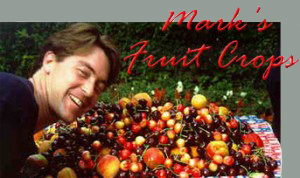 Fruit require 3-6 months for development, depending on cultivar, but the main harvest season is May 1 – July 15 in California. Apricots are thinned by hand, leaving 1 fruit per 3-5″ of shoot length. 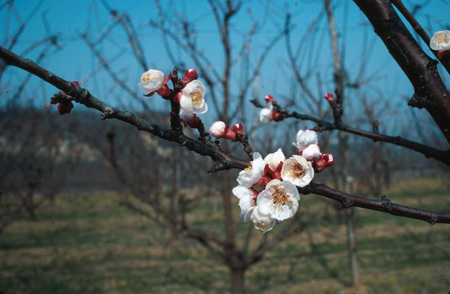 Apricot seedlings are most common worldwide; ‘Blenheim’ in California, ‘Canino’ in France, ‘Hungarian Best’ in Hungary. Peach seedling rootstocks ‘GF 305,’ ‘Lovell,’ and ‘Nemaguard’ are used as well. 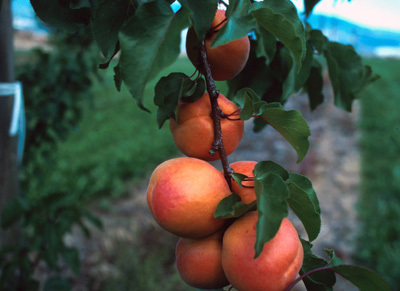 Apricots are planted in solid blocks if self-fruitful, at spacings of up to 20-24 ft between trees and rows. They are trained as open center trees. Generally, all new growth and interfering wood is removed each year, exposing the spurs to maximal sunlight. Apricots for fresh consumption are picked firm-mature; firmness is a reliable indicator, as for plums. Days from full bloom is a fairly reliable index given the relatively invariable growing conditions in California. Apricots for fresh consumption or processing are picked by hand and carefully handled. Trees are usually picked over 2-3 times each, when fruit are firm. Trunk shaking can be used for processed fruit, although apricots are said to be more susceptible to trunk damage than other stone fruits. Fresh apricots are shipped in shallow containers to prevent crushing/bruising. Dried apricots are harvested later (fully ripe) than those for shipping, and exposed to SO2 to avoid post-harvest diseases. The drying ratio is 5.5:1 (lbs fresh fruit: lb dry fruit). Drying is either natural, in the sun, or in large dehydrators as with prunes. Canned apricots are immersed in syrup, at a ratio of 0.7 lbs fresh = 1 lb canned. Apricots have an extremely short shelf-life of only 1-2 weeks at 0° C and 90% relative humidity. They are susceptible to all post-harvest diseases (e.g., Rhizopus fruit rot) to which other stone fruits are susceptible.